Our latest video installment in Quest of a Con Vendor is a bit different. This time, we’re taking a look at running the business and trying to figure out our product line up to create that thing that everyone wants. New York Comic Con is ON Baby! We leave tomorrow for New York Comic Con and will be setting up and getting ready to meet all of our Kickstarter backers and our preorder customers plus all of the awesome new people we hope will come by booth 2770 to check out our stuff! We have a new booth display that we are SO excited about, so even though we are in the far back, you will hopefully recognize us when you get there! Don’t forget to come by early to get our NYCC 2014 Show Exclusive Pin! They are $5 when you buy a journal, $7 on their own. We only have 200 of them, so they will go fast! You can pin them to the binding on your journal or tote bag to signify that all of your NYCC goodness is inside your journal. 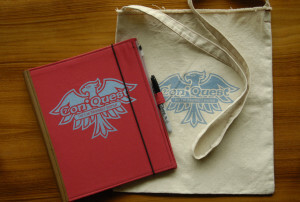 The Con*Quest Adventure Journal™ is the perfect place to store all of your artwork, photo-ops and autographs. 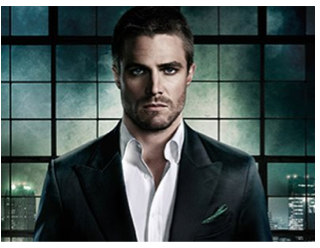 I have signed up to get my picture with Stephen Amell aka Arrow, so I’m pretty excited to add him to my journal! We are so excited to test new merchandise exclusively at New York Comic Con. With our manufacturing partner, we have developed three new products that we think you will love and that will add a really special vibe to the whole show: Con*Pliment Cards™, Con*Panion Note Cards™ and Con*Panion Mini Journals! I think we are most excited about the Con*Pliment Cards, which are business sized cards with con specific compliments that you can pass out to awesome people you meet. There’s a line on the back to include your contact info, but you don’t have to do that. You can just give fellow attendees a Con*Pliment just to spread kindness and fun. We’re only bringing about 25 sets of each, so if you want to get some of our newest stuff, get to our booth 2770 early! Watch our Twitter and Facebook, I’ll reveal the new stuff online as soon as we have it in our hands. We can’t wait to see you all at NYCC! NYCC 2014 Exhibitor Exclusive Box Opening! For the very first time, we are offering a lapel style pin as our show exclusive for New York Comic Con 2014. With just 2 weeks until the show, I received the pins and opened them up for the first time! 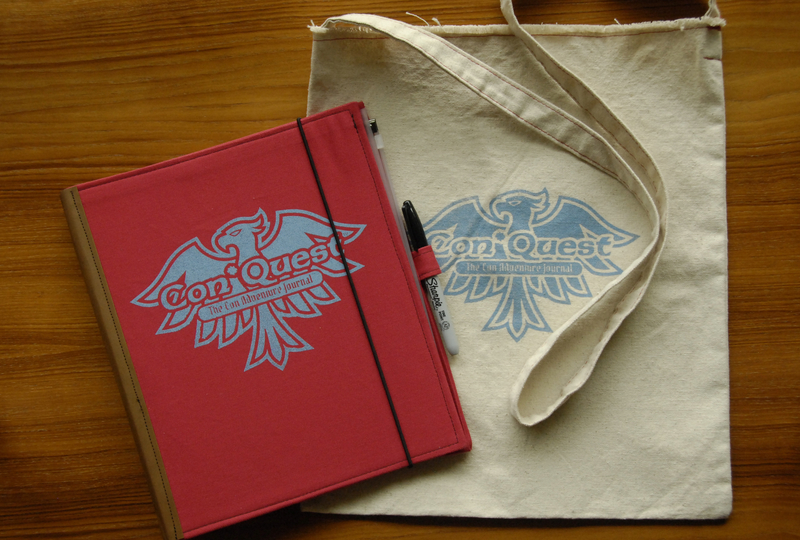 These will make great collectibles to commemorate the con and you can stick them on the binding of your Con*Quest Adventure Journal to customize it for the show. 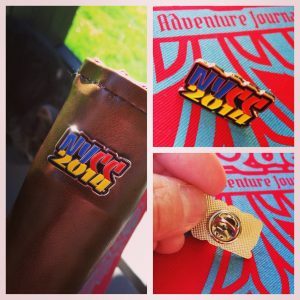 Check out my video unveiling below and stop by our booth at NYCC, #2770 to get your Con*Quest Adventure Journal and exhibitor exclusive pin. You can still preorder the journal in our Etsy shop as well! We are having a pre-order special for NYCC! Get $5 off a bag and journal when you pre-order through our Esty shop! You can then pick up your journal and bag at the show in our booth #2770! In the NYCC newsletter, the link leads you to our website, but the special is actually at this link: https://www.etsy.com/listing/198237362/nycc-pre-order-special-price-conquest?ref=shop_home_active_1. Our journal and bag will be $40 at the show, so be sure to pre-order at the $35 special price! 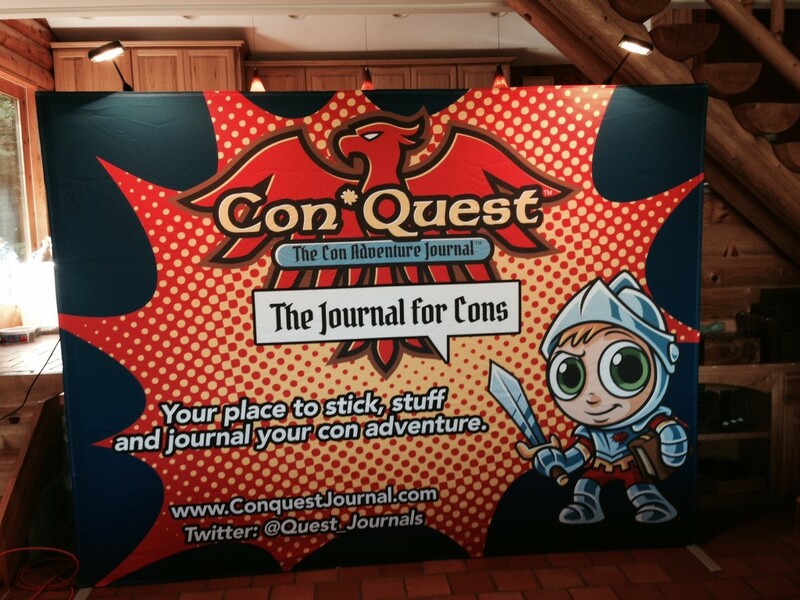 So pre-order now and make sure you have the best way to capture your con! First we just want to say THANK YOU to all of the amazing backers of our successful Kickstarter campaign! We are so very grateful for all of the support, sharing, and general awesome response that we received. What a wild ride it was! There were so many lessons that we learned through the process: how effective videos can be, how we need to continue reaching out to people and networking, how important it is to keep getting the journal in reviewers’ hands and how effective con email blasts are at marketing the journal. But most of all we learned that people love the journal and that has made us more excited than ever to continue building this business and adding new accessories and versions to grow it further. Keep watching the site as we add those accessories and more on our Get It page. Pre-order journals here for $5 off before the show! We will be adding more shows to the fall schedule as we work through the next few weeks and get a feel for inventory and what shows we can get to! Please comment if you have questions and keep checking back with us!